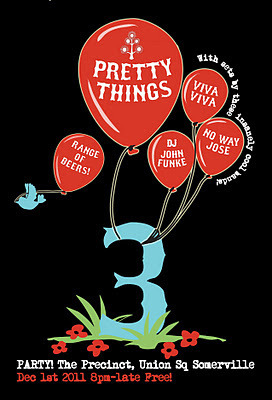 Our friends at Pretty Things Beer & Ale Project asked us to play their 3rd birthday party and we're pretty excited! Pretty Things is arguable the best locally brewed craft beer in the Boston area (they are located right in Somerville!) and their Jack D'Or is damn tasty! They do it all DIY too - creating their own labels and what not - so we're down to support their cause, and celebrate along with them! Come out to Precinct in Union Sq, Somerville, Thursday December 1, to celebrate along with us! It's a FREE show, and it all starts at 8pm. DJ John Funke of WMBR is spinning some jams, and No Way Jose will also be rocking the house along with us. If you can't make it out to the Pretty Things party, hopefully you'll also have a chance to catch Chris Warren performing some solo joints at ZuZu, in Central Sq, Cambridge, on Monday December 5, for Night of the Living Deadhead, with Manners and Jason Nichols.